Harold Schroetter (pictured) went missing from his residence in Falcon Heights, MN on February 26, 2009. He was a postal worker in St. Paul and had never missed work for unexplained reasons before his disappearance. Harold was in the process of ending his relationship with his live-in girlfriend and changing the beneficiaries of his estate at the time of his disappearance. He was also excited to recently find out he was to become a grandfather. Authorities located Schroetter’s red Chrysler under suspicious circumstances in the area of Arlington Ave, and Jackson St. in St. Paul on March 1, 2009. Authorities believed foul play was involved in his disappearance and he is believed to be deceased. Blood from Schroetter was found in the trunk of his girlfriend’s car, a white Chrysler 300. A new trunk liner had been purchased and replaced shortly after his disappearance. This case has been designated by the Spotlight on Crime Fund of the Minnesota Department of Public Safety for a $50,000 reward. The reward of $50,000 is separate from any reward offered to be paid by Crime Stoppers of Minnesota, which is an offer of up to $1,000 for information submitted through the Crime Stoppers website. 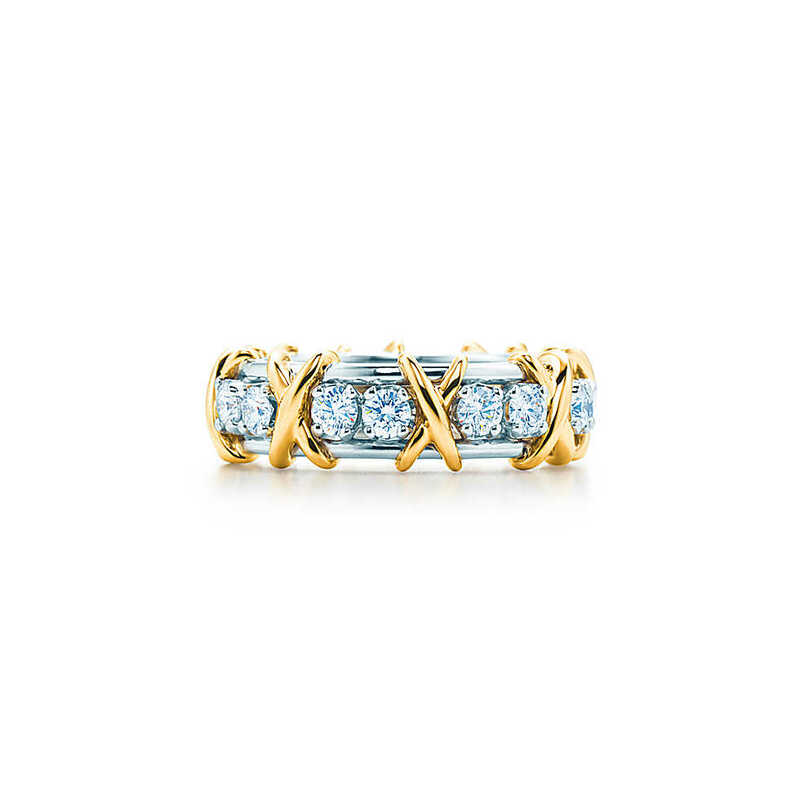 Information about the suspect(s) or about the jewelry being seen or attempted to be sold provided through Crime Stoppers will be sent to the Bloomington investigators and you can remain anonymous. New playground equipment set to be installed was destroyed by arson the night before work was to begin. The new equipment was at Plymouth Creek Park located at 3625 Fernbrook Lane, in Plymouth MN. The fire happened just after midnight on Friday, August 15, 2014 damaging all of the new equipment. The State Fire Marshal and Plymouth Police investigators have determined the cause to be arson but have no leads about who started this fire estimated at over $200,000 in damage. If you saw or heard any activity in the park at that time, or if you know of who may have been involved in causing this damage (pictured), you can contact Crime Stoppers of Minnesota and remain anonymous, and if that information leads to an arrest, you may qualify for a reward of up to $1,000. 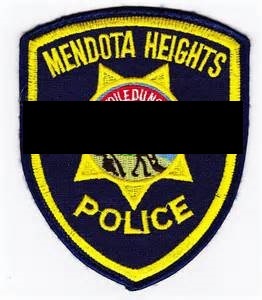 At a traffic stop on July 30, 2014 of a car in West St. Paul, Mendota Heights Police Officer Scott Patrick was shot and killed by that vehicle’s driver. Officer Patrick was a 19 year veteran of that Police Department, a husband, and father of two. Crime Stoppers of Minnesota joins in feeling the sorrow of all law enforcement and all law-abiding citizens in the loss of this public servant who was performing his duty of serving his community to keep it safe. We offer special condolences to the family and colleagues of dedicated Officer Scott Patrick. 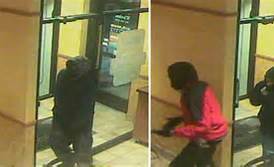 A pistol toting trio of masked robbers who have held stickups at sandwich restaurants may be the same group. Two Subways were robbed on Thursday, March 20, one at 7 a.m. at 2400 E. Hennepin Av., the second was at 8:30 a.m. just over two miles to the north in the St. Anthony Shopping Center at 2900 NE. Pentagon Drive. Other sandwich shops robbed in this spree are a Subway struck at about 7:30 a.m. on Thursday, March 13 located at 50th Street near Chowen Avenue S, a Subway about 9:50 p.m. Sunday, March 16 at 3541 Cedar Av. S., and a Quiznos at 1851 Washington Av. S., just west of the University of Minnesota. The same robbers may have also struck at the Lone Spur Grill and Bar on Cedar Lake Road in Minnetonka on Monday, March 17. Authorities are not yet certain that all of the robberies are related but are seeking information about any of these crimes that may describe the culprits, their vehicle, where they may have gone or that they are bragging about their escapades. Descriptions from the Chowen Av. Subway are that they appear to be in their late teens to late 20’s. At least two of them are identified as African American, the third is unknown. Because these are armed robbers (pictured) who have roughed up restaurant employees and put them in refrigerated coolers, they pose a dangerous threat for wherever they may strike. Authorities in Minnetonka, Minneapolis and St. Anthony Village are working together to identify these criminals. 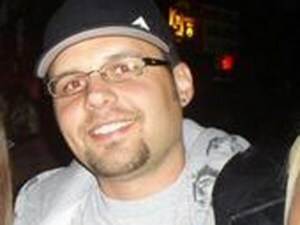 On Saturday, July 25th, 2009 at approximately 2:00 a.m., Paul Fisher (pictured) was murdered as he approached the parking lot entrance to his apartment building at 5301 Chicago Avenue South, in Minneapolis. Policed have been frustrated by the lack of leads about how this crime could happen to Paul on the step of his home. Information about a possible vehicle in the area, sounds that may have been heard, people that may have been seen, is needed. If you have heard somebody talk about or boast about this crime you can share that information and remain anonymous and earn a reward of up to $1,000. Minneapolis Police Department Homicide Investigators continue to urge the public to call them or Crime Stoppers if they have any information that might help them solve the murder of 76-year-old Lois Swenson (pictured). 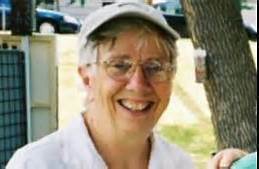 Swenson, a popular peace, justice, and environmental activist, was brutally killed inside her own home on the 2200 block of Vincent Avenue North in early June of 2012. There was no sign of forced entry at the victim’s home. Her body was discovered when friends and family members had become concerned that they hadn’t heard from Swenson in several days. Police haven’t received a lot of new information in recent months in spite of earnest efforts to solve this case. “We believe we know who’s involved” Minneapolis Police Lieutenant Richard Zimmerman said. Lt. Zimmerman believes someone close to the suspect may have the information investigators need. “In my near 20 years as a homicide investigator, we’ve never been so close to a suspect without being able to charge him. We just need a little bit more, anyone who has talked to this person please call us or Crime Stoppers,” Zimmerman concluded. In addition to the Lieutenant, 2 other detectives have been working on this case for almost 2 years now but have yet to find the information they’re looking for which is why they are updating the public through the use of Crime Stoppers with the need for that information. The Minneapolis Police want to re-emphasize that Crime Stoppers of Minnesota has long provided an avenue for the public to provide information to police anonymously. Additionally, Crime Stoppers of Minnesota offers a cash reward of up to $1000 for information provided through Crime Stoppers that leads to an arrest. With specially donated funds and a partnership with Spotlight On Crime, a reward of up to $60,000 is available to help find who murdered Terrell Mayes just 3 years old. This partnership brings together monies from corporations that view this crime with deep concern by supporting the nonprofit Spotlight On Crime and donations to Crime Stoppers of Minnesota from individuals in communities across Minnesota as well as other states, as far away as New York. A person coming forward with information that helps solve this tragic crime will qualify for a reward of up to $60,000 depending on how useful that information is. Both organizations and their broad base of supporters see this crime as heartless and seek the help of the public to come forward with information with the ability to remain anonymous. 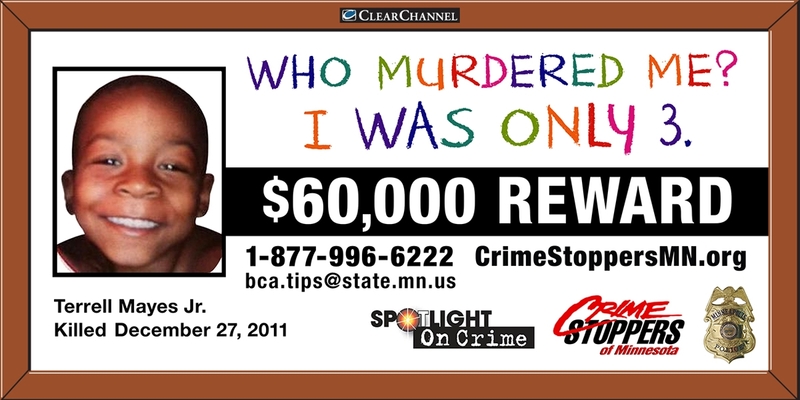 Information can be given to Crime Stoppers of Minnesota on this website or to Spotlight on Crime by clicking here. On Monday, December 26, 2011 Police responded to a report of shots being fired in the area of 2600 Colfax Av. N. in Minneapolis. It was found that shots had penetrated the house where 3 year old Terrell Mayes, Jr. lived and where he with his youthful friends were running upstairs to seek protection from the shots they heard. One of those shots struck Terrell who was taken to the hospital where he died on the next day. Minneapolis Police have determined that this was a random shooting and that there was nobody in the house nor the family who was the intended target. If you have any information regarding the person or persons committing this crime you can come forward...remain anonymous...and may qualify for a reward. Please help Solve This Crime. On Tuesday, April 2 at 3:20 p.m. officers from the Fourth Precinct responded to a shooting in the 1000 block of Humboldt Avenue North. Information received from the 911 caller indicated that a victim was shot and lying in the street. When police and medical personnel arrived within minutes, they located Tommy Bardney age 34 dead from an apparent gunshot wound to the head. 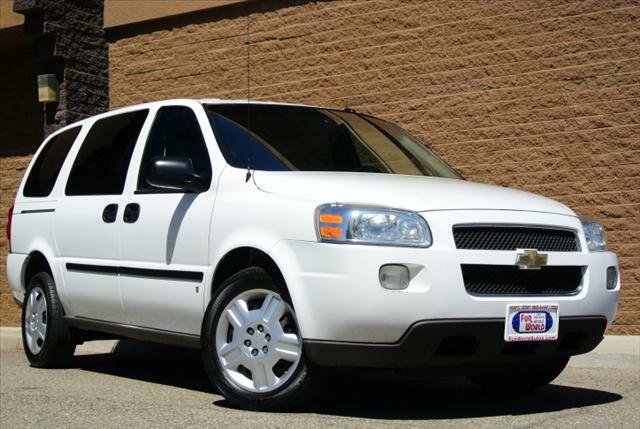 After reviewing evidence and talking to witnesses it was determined that the suspect was inside a vehicle described as a 2005 to 2008 white Chevrolet Uplander, similar to the vehicle pictured. There were at least two occupants in the vehicle at the time of the shooting. If you have any information related to this suspect vehicle or the suspects involved please Help Solve This Crime. Minneapolis Police are seeking help to solve the homicide of Frank Patterson in his apartment in the 2800 block of Cedar Avenue South. On Monday, March 4, 2013 officers in the Third Precinct responded to a shooting in the apartment just before 4:30 a.m. When officers arrived they found Patterson suffering from an apparent gunshot wound. EMS transported the victim to HCMC where he passed away a short time later. Investigators have since learned that the victim was shot and killed inside his apartment after 2 suspects forced their way inside. The suspected shooter is described as a thin black male, 5’6” in tall, wearing a black colored construction type jacket (possible Carhartt brand). The other suspect was described as a black male over 5’06” tall. The handgun used in the murder, a black 9mm semi-automatic handgun has not been recovered. Police believe that both suspects may live in close proximity of the homicide location. If you know who these suspects are, where they can be found or have ANY information about this homicide, you can Help Solve This Crime from this website and remain anonymous. On Saturday, March 23 about 2:30 a.m. Daniel W. Vaughn, 42, was run over at 32nd Street and Snelling Avenue S., a few blocks from his home on 29th Avenue S., Minneapolis. The driver fled the scene and did not notify authorities. Vaughn died about 45 minutes later at Hennepin County Medical Center in Minneapolis. “Since the investigation began, no one has come forward to claim responsibility … and investigators are seeking information from the public to identify the driver involved and locate the vehicle that the person was driving,” police said in a statement. If you have information about the vehicle involved in this death, the driver, or the events of that night you can help Solve This Crime and remain anonymous. Wednesday, February 20 is the 10 year anniversary of the death of Rebecca Nelson (pictured). In 2003, Maple Grove PD responded to an accident at the Maple Grove Community Center. Due to the nature of Rebecca’s injuries, the incident appears to have been the result of a motor vehicle accident. The case remains unsolved. Anyone with information can submit an anonymous tip to help Solve This Crime. Victoria Jane Owczynsky has been missing for 22 years, having gone missing on August 26, 1990. She was living in northeast Minneapolis on the 300 block of 15th Avenue. Investigators have pursued numerous leads and talked to several people about her disappearance, but with few results. Pictured is a composite picture of what she may look like today at age 39 next to how she looked at age 17. 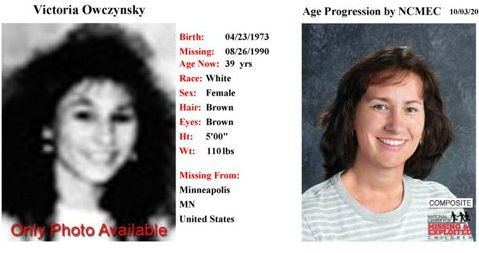 Owczynsky is described as a white female with brown hair, brown eyes and has a birthmark under her left eye. In 1990, she was five feet tall and weighed approximately 110 pounds. When she was last seen, her hair was highlighted. If you know of her whereabouts you can come forward and remain anonymous to help solve this case. Just after 3 a.m. on Saturday, December 8th patrol officers in the Minneapolis Third Precinct responded to a report of a sexual assault near 24th Street East and Chicago Avenue South. Responding officers were told by the 33 year-old female victim that she had been followed off of a bus and then sexually assaulted by a male unknown to her. Investigators have recovered photographs of the male (pictured) believed responsible for this assault. He is described as a black male, 30-40 years old, with a thin moustache and possible goatee. At the time of the incident he was wearing a skull or knit cap with a lighter colored design band around it and a dark colored puffy jacket. If you know this person or where he can be found you can remain anonymous and help solve this crime by clicking here. On Monday, October 29, 2012 around 10:15 pm, the BP station located off Hwy 169 and 197th Av. in Elk River was robbed at gunpoint. The suspect was described as a tall white male between 5`10” and 6`00.” He was wearing a blue ski mask, black beanie and a dark-gray sweatshirt with dark blue jeans and tennis shoes with white soles, which were described as being brand new looking. The suspect had a black semi-automatic handgun that he was aiming at the lone clerk. The victim didn’t remember whether or not he was wearing gloves. The suspect appeared to have been trying to disguise his voice. The clerk was ordered down to the office floor which was located behind the cashier booth. The suspect took an undisclosed amount of cash. He also stole five packs of cigarettes. The suspect fled by unknown means in an unknown direction. The suspect was said to be very calm. Potential DNA/prints were recovered at the store. During the summer of 2012 there have been a number of arson fires that have resulted in damage to property and damage to dwellings in the area of 94th Street and Portland/Oakland Avenue South in Bloomington. Additional fires have occurred this past month during the overnight hours. Currently, no one has been charged in connection with these cases. On Saturday, September 8, Second Precinct patrol officers responded to the B Line Market at 1901 Fillmore Street Northeast in Minneapolis on a robbery of business call. Officers learned that a lone male entered the business grabbed the clerk and demanded money. The suspect is described as a black male with a light complexion, possibly of Somali decent. He was approximately 5’11” with a thin build. He appeared to range in age from 21 to 30 years. He was wearing a black shirt and pants with a dark hat. It appeared that his hair was in long braids underneath the hat. His face was covered with a red bandana. He was also wearing green gloves and had a chain wrapped around his left hand. The suspect fled from the store on foot. On Saturday, July 14, 2012 officers from the Fourth Precinct responded to 1710 Glenwood Avenue North on a shooting. When they arrived they learned that an adult female had been shot. The female was pronounced dead at the scene. In the following days, the Hennepin County Medical Examiner Office identified the victim as Adelaida Lane and her cause of death was a gunshot wound, the manner of death was deemed to be a homicide. At this time, the Minneapolis Police Department is seeking the public’s help to locate a person wanted in this case. Giovanni Mario Dotts (date of birth 9-12-1988) is described as a black male, 5’10” with a medium build and black hair. If anybody knows his whereabouts or sees him, we are asking that they call Crime Stoppers immediately. Do not approach this individual. On Wednesday, June 27, Matthew Call was attempting to get into his vehicle in the 2400 block of Lyndale Av. S about 6 p.m. when he was struck by a motorist. The motorist failed to stop and fled the scene in what was described as a black Jeep Grand Cherokee sports utility vehicle. The driver was described as a white male. The victim was transported to the Hennepin County Medical Center where he remained for several days with multiple broken bones. This case is being investigated by the Traffic Unit of the Minneapolis Police and needs additional information from a passerby, a person who knows the hit and run driver or somebody who has seen this type of vehicle with damage. On Tuesday, June 26, 2012 at 8:37 a.m. Minneapolis police officers were dispatched to the 4500 block of Bryant Avenue North on a shooting. When they arrived they learned that a young child had been shot. 5 year old Nizzel George (pictured) was pronounced dead at North Memorial Medical Center. Authorities believe the shooter had been standing across the street and ran off after spraying the house with gunfire as part of what police called an "ongoing dispute" involving two groups of people. They believe there was only one shooter, a young person, who a neighbor saw run north on Bryant Avenue. Persons with knowledge of this shooter and where he can be found are urged to come forward on this website or by calling 1-800-222-8477 with the information. You can remain anonymous by contacting Crime Stoppers of Minnesota and help Solve This Crime.